That quote was given to me – by a visiting nurse…it holds so true!!! I wanted to THANK you all for stopping by this week and reading about Joshua. This will be my last entry about him for the time being. Nothing could ever prepare you to lose your child – I would give my life to have 5 minutes to say Good-bye to him – to hold him one more time – kiss him one more time..I don’t think the pain ever goes away – it just becomes embedded in your life..and you start weaving your life around it. Yes I have Crystalyn – she is my world…I truly believe I would not be around if it wasn’t for her…she gave me a reason to live..a reason to go with life. I am very thankful for the close bond we have with each other..only her and I can share that spiritual connection with Joshua..it is a something I hang on to. I guess I could go on and on but I will leave you all with this bit of wisdom from me: HUG your loved ones as often as possible…never take them for granted…tell them at every opportunity how much you LOVE them…ENJOY every moment you have with them…because truly NO ONE IS GUARANTEED TOMORROW. 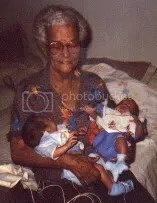 This is one of my most favorite pictures…It is my grandmother holding her great grandchildren. This is the first time that she had seen them since they were born. 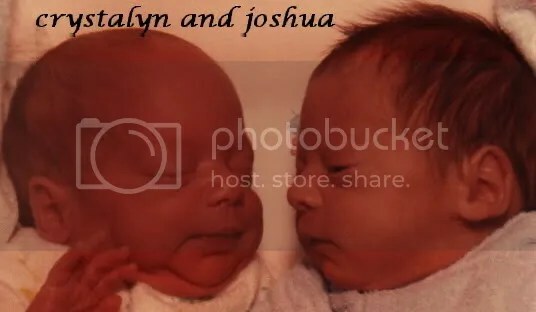 This was taken during the first week they were out of the hospital. 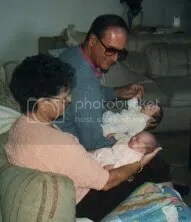 The outfits they have on are for preemies yet they are falling right off the babies…we must have redressed them them in those outfits a dozen times before arriving at my parents house just to get some pictures..then afterwards put them in onesies..which to me were wonderful. As you can see the heart monitor leads hanging down.. their tiny little bodies in my grandmother’s arms…my grandmother passed away a few months later so this picture is extremely sentimental to me. After this visit – I realized what a massive job it was to get three kids ready (the older siblings) and then twins just to go anywhere..it really took a toll on me. I think I lived on adrenaline for the first year after having the twins. I will say that both babies were WONDERFUL to travel with – get ready – do anything with…always happy and content…always laughing!!! My time with the two of them together is something I will always cherish! Just thought I would show off another picture…Just remembering some precious times! Thanks for stopping by and Looking!!!! Pictures of my parents the day after we brought the babies home…you can see the heart wire leads hanging down in the picture on the left. Just remembering some great times!!! Isn’t that was remembrance of our loved ones is all about. Thanks for stopping by and Looking!!! 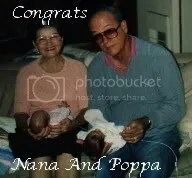 The photo above was taken the day the babies were released from the hospital.. I want to THANK YOU for your warm kind comments…they have all touched my heart beyond what I could ever describe here – I thought for a very long time that I was handling things…but I think A LOT of the depression that I have been fighting has something to do with losing Joshua. 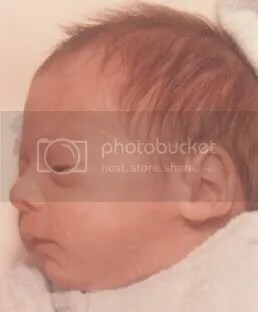 I feel VERY RESPONSIBLE for his death…No I did not hurt him….but parents who lose a child to SIDS always carry the burden of thinking they did something wrong or could have prevented it all somehow. It is very difficult to get past that. Whatever you may read about SIDS…do not fool yourself into thinking that putting a baby on his stomach or its back will prevent it..I know way too many parents that were holding their babies and the baby just died in their arms due to SIDS…it is something about the brain NOT sending the messages to the heart and lungs to beat and breathe…there is no cure…and so much research still has to be done…and 17 years later after losing Joshua – they are NO CLOSER to finding any answers. I am blessed in many ways – though you may think it is crazy – but Joshua did so many things before passing on….He touched a horse ( a home visiting nurse took him outside and he got to touch our horse and watch it run) – he danced…a friend of mine and I put on some great music in the daycare (that I was running at the time) and we picked up the babies, and danced all over with them…Joshua just laughed and laughed..it was hysterical. The day we brought Joshua home – I remember sitting his baby seat down and he just started laughing (it sounded like the cheetah cartoon character from the fritos commercial)…it was so funny..so we called him cheesy from that day forward. My ex said it was the angels talking to him (hmmm – maybe). When you would hold him – he clung to you like he was hugging…it was so wonderful to feel him do that…I have never felt a baby do it like he did…I used to have this beautiful dog named Cleo (german short-haired pointer) who took to the babies immediately – became their personal body guards…and when I brought them home – Cleo laid her head across Joshua’s lap and he stopped fussing…she became his protector – it really was amazing. When the twins came home – they weighed over 4 pounds…BUT NOTHING FIT THEM…they were toooo small. We had to order these special preemie diapers from the pampers company – the diapers were so small they could fit inside a wallet (were your dollar bills go)…it was wild..yet they were big on my babies. So we had to go shopping at a toy store and buy premie cabbage patch clothes to fit them until they could gain some weight. In the state of Florida – You had to go through these “tests” to see if you can take care of your preemie babies once the hospital released them. You also had to attend special classes to learn to think preemie. (I kid you not) So they had to see you bathe your baby and feed them and change their diapers, and give them medicine and change/fix/set up their heart monitors – and breathing machines, dress and undress them, wrap them in blankets, how you hold them, how you walk with them, how you pick them up and set them down, how you put them in a car seat and take them out and on and on. I remember when I had to bathe the babies – they were so small we had to use 4×4 gauze pads for a wash cloth that were softened by baby soap and warm…because their bodies were so small – washcloths were too big and bulky …so differently then having a baby that goes full term. 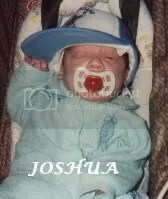 Well that is my entry today about Joshua…it kind of wipes me out so I will continue later…I am not upset – just thinking back to all these times brings back a flood of memories that I have not thought of in a long time!!! Thanks for reading this far…I appreciate the caring and compassion you all have shown me…truly – from the bottom of my heart – THANK YOU!